How does a hubot instance automate tasks and promote workplace culture? Meet Charlie. Charlie came out of no where for us. His creation was a small chance of coincidence of having been in the right place at the right time. In 2016, eight engineers went to GitHub Universe. We had been using GitHub for about year and GitHub Universe seemed like a great way to gauge how we were doing as a company. The day before the conference, GitHub offered a training day. During one of the afternoon sessions we had the option of git or something called hubot. The class on git was popular and did not have space for the whole group. We sent the larger half of our group to the git talk while two of us headed upstairs to attend the talk on this hubot thing. Going into the talk we were thinking “Great, this will be like a silly IRC bot. How useful can it be?” Wow, were we wrong! The presenters talked about hubot’s current implementation and how they use their “little” bot to do tons of tasks, from pulling graphs of their systems to actually deploying GitHub itself. We had a few ideas of our own by the end of the class. By the end of the conference, we had a lot. Back in the office, we started by setting him up locally on our computers and made scripts that we thought would be useful. It took until our 2017 hackathon that we were able to pull together a small team and implement the bot for the organization. We called our hubot instance “Charlie” after our company founder, Charles Henry Robinson. We’ve had Charlie around for nearly a year now. In that time we’ve learned a lot about spinning up what was essentially a side project and rolling it out organization wide. When first rolling out Charlie, we had no visibility to how people were talking to him. This made it difficult to gather usage, debug, and plan new features. 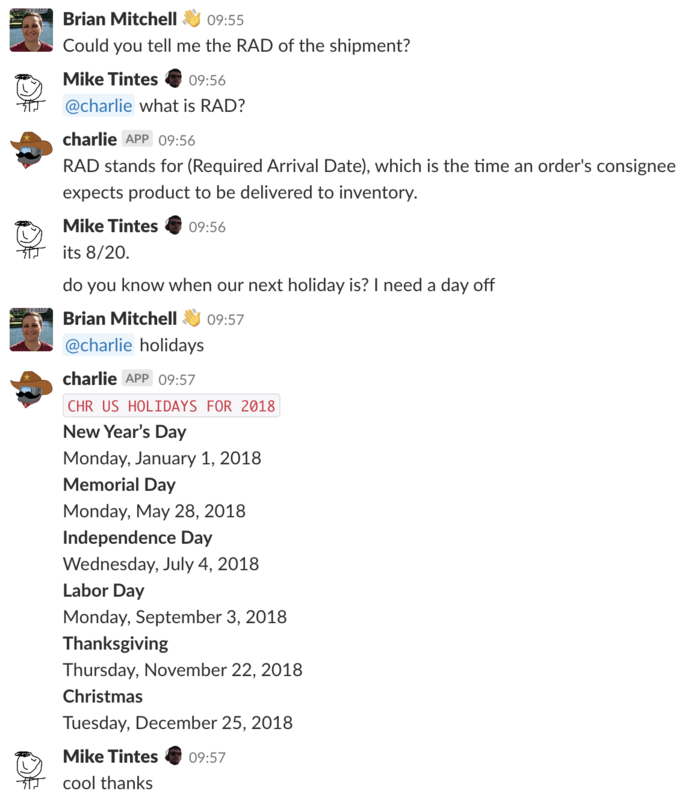 We use hubot’s listenerMiddleware to log every command that flows into Charlie. We store the triggering request: the username of the issuing user and the message text. With this, we can provide analytics on the use of Charlie and reach out to the most active users and ask for feedback or contributions. We have barely scratched the surface towards our vision of Charlie. Continuing to separate each script into its own repository/module (instead of everything living in a single repository). This will increase the modularity of scripts, and is inline with the architecture of hubot 3. These ideas will decrease the barrier to entry for new contributors and deliver a more stable Charlie. We love when new people want to get involved to contribute to Charlie. 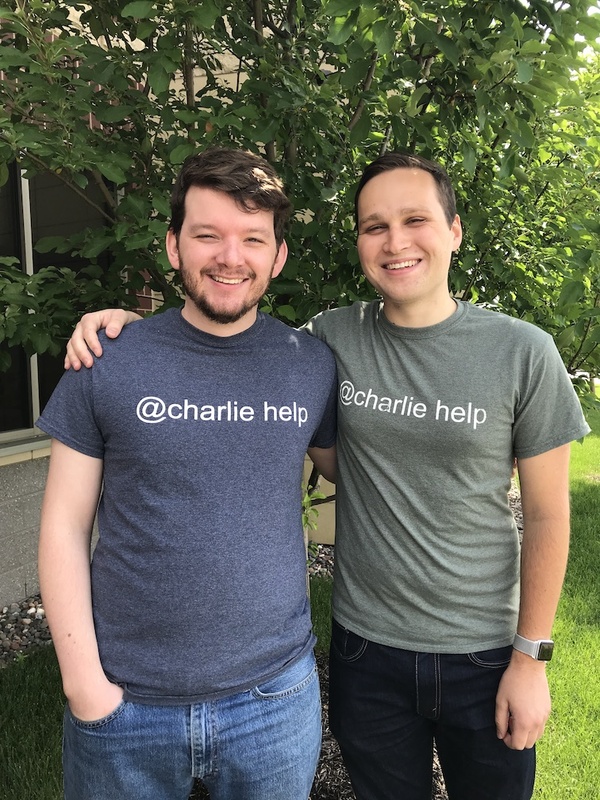 To internally advertise for Charlie and to spread the awareness, we give contributors T-Shirts (they say “@charlie help”) and stickers with our Charlie logo. We have hubot and Charlie (without a star) stickers that anyone can collect. DevOps guy and chatbot enthusiast. Software Engineer II (and emoji lover 👋) on the Customer Facing Analytics team. The information in this blog is designed to provide helpful information on the subjects discussed. The opinions expressed are those of each blog articles’ authors and are not the opinions of C.H. Robinson Worldwide, Inc. and/or its subsidiaries (“C.H. Robinson”). Comments made in any forums associated with this blog by C.H. Robinson employees or other third parties are strictly their own personal views made in their own personal capacity regarding the subjects discussed. The information available through this blog is provided “AS IS” without warranty of any kind, and no assurance is given that any statement contained in the blog is true, correct, or precise. C.H. Robinson does not accept any responsibility or liability for the accuracy, content, completeness, legality, or reliability of the information provided in this blog. C.H. Robinson shall not be liable for any loss or damage of whatever nature (whether direct, indirect, consequential or other), however arising, which may arise as a result of your use or this blog or the information contained in this blog. This blog may contain links to other blogs or websites owned by third parties. The content of such third party sites is not within C.H. Robinson’s control and C.H. Robinson cannot and will not take any responsibility for the information, content, or security of such third party websites. References, including but not limited to third party websites, are provided for informational purposes only and do not constitute the endorsement by C.H. Robinson of any website or any products or processes offered, promoted, sold or otherwise made available. C.H. Robinson does not warrant that such websites are free from computer viruses or anything else that has destructive properties.